SAN GABRIEL, Calif. - April 19, 2017 - PRLog -- Edison International President and CEO Pedro J. Pizarro presented Don Bosco Technical Institute (Bosco Tech) senior Willam Ramos with a 2017 Edison International Scholar award and scholarship on April 10. 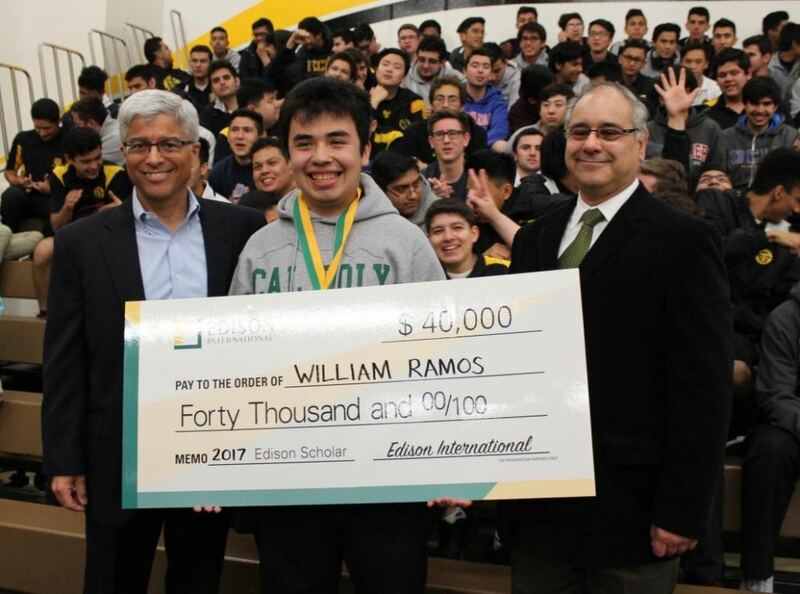 Ramos, who will begin his studies in chemistry at California Polytechnic State University, San Luis Obispo (SLO) this fall, was one of 1,200 applicants for the scholarship that is annually awarded to 30 high-achieving high school seniors within Edison's broad service area who plan to pursue STEM degrees at four-year colleges and universities. "Edison International congratulates this year's outstanding scholars," said Pizarro. "Through their pursuit of science, technology, engineering and math, we believe these students will make important contributions to our communities and society. We are proud to support them." Ramos, who was surprised and excited to receive the Edison award, is studying Materials Science, Engineering & Technology (MSET). He is a member of the school's award-winning band, a Youth Ministry program leader, and a Bosco Tech Ambassador. "William truly epitomizes what a Bosco Tech student is," said Bosco Tech President Xavier Jimenez. "He is an intelligent, inquisitive student who wholeheartedly applies himself to his studies and who appreciates the opportunity to learn. He plans to become a teacher in order to instill in other young people a love of science. We're thrilled that Edison International has recognized William's abilities and potential." Celebrating its sixty second year, Bosco Tech is an all-male Catholic high school that combines a rigorous college-preparatory program with a technology-focused education. The innovative STEM curriculum allows students to exceed university admission requirements while completing extensive integrated coursework in one of five applied science and engineering fields. Each year for the past several years, one hundred percent of the graduating class has earned college acceptances. Visit www.boscotech.edu for more information. Edison International, through its subsidiaries, is a generator and distributor of electric power, as well as a provider of energy services and technologies, including renewable energy. Headquartered in Rosemead, Calif., Edison International is the parent company of Southern California Edison, one of the nation's largest electric utilities. Edison International's support of charitable causes, such as the Edison Scholars Program, is funded entirely by Edison International shareholders; SCE customers' utility bill payments do not fund company donations.